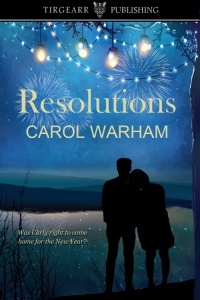 I’m delighted to be taking part in the blog tour for Carol Warham’s debut novel, “Resolutions”. Hi Jenny, thank you for inviting me along to your blog and offering me the opportunity of writing a guest post. I wondered for a while what I should write about but then it hit me; without the support of people like yourself, bloggers, reviewers, social media writer friends and those I’ve now met in ‘real’ life, I wouldn’t have a novel to talk about. I have recently had the pleasure of ‘appearing’ on a few blogs, answering questions about myself and my first novel RESOLUTIONS. Most of the questions have centred around where the idea came from and how it developed. This would be followed by a discussion about my ‘journey’ to publication. It occurred to me that one of the main things a writer, or would-be author, really needs never entered into the questions, or not as fully as I felt it should. One of the things I recognised as most important to me was support. The support of family and friends is, of course, important and probably taken for granted at times. When we are tapping away at the keyboard late at night or at any odd times of the day, we quite possibly are forgetting those around us. However for me the main support has come from other writers. The writing groups on social media have been invaluable. Many writers have been generous with their advice, information and suggestions. Others have supported by hosting me on their blogs and offering reviews. It is hard to describe how much this means to a new author, it has been overwhelming. You are bolstered up by a whole community, including other new writers and some very well-known ones. It is a delight to belong to such a caring and supportive group of people. I am especially indebted to those I’m proud to call my special friends. These are the writers that I now know personally, and am able to meet up with on occasions. They have been there for me every step of the way. They have never grumbled when I’ve distracted them from their own writing and deadlines. Every time I have sought advice, on any subject, it has been freely given. My grammar and punctuation have been corrected, and suggestions have been made to overcome lengthy sentences and ‘clunky’ passages. Sometimes I’ve been given a kick up the proverbial, when suddenly the ironing or even cleaning the windows has looked so much more interesting than sitting at a key board. I have been encouraged and praised during those times when I felt the whole book was totally rubbish and I was a failure as a writer. Believe me, those times came frequently. If it wasn’t for my friends, the manuscript would have been in the virtual bin many times. When I’ve been stuck as to which way to go or what was needed in taking the story forward, the suggestions have flowed into my inbox. At other times we’ve discussed them over endless cups of coffee or Harry Ramsden’s fish and chip lunches. Without this community and certainly without my friends I would never have been in the happy position of having my first novel published, by Tirgearr. As she walked slowly along the main street, she sensed eyes watching her. Perhaps some people recognised her, while others were unsure as to whether it was her or not. Her slow progress continued up High Street, passing all the shops she knew so well. Belle’s Book Shop stood on the corner, with its lovely little café serving homemade baking. She remembered the days when her mum met her from school and they had gone there for something to eat and to browse the bookshelves. They always seemed to leave with a new book to read. As she grew older, she was allowed to meet her friends there. Eventually, she and Steve had their first date there. They’d both been only fifteen, and sat sipping hot chocolate and talking for hours. On their first walk home together, he’d held her hand and given her a shy peck on the cheek when they reached her front door. Silvio’s Italian Deli was next door. Going in there was always a treat, with its delicious aromas of cheeses and traditional cured hams. Her dad would take her in, saying they were going to buy a treat for her mum, but she knew it was really for himself. The next shop was Adrienne’s Dress Boutique, very expensive, but always busy. She had known and loved all these shops – and their owners – since she was a child, but now she was reluctant to go through any of their doors. She turned down one of the steep cobbled side streets, walking carefully since the uneven cobbles tended to be slippery when wet. The Victorian bow window of Earnshaw’s Antique and Bric-a-Brac shop caught her eye. There was always something of interest in the window display. She had spent many a quiet hour browsing through the shop, delighting in ornaments, furniture pieces, silken scarves, and occasionally some vintage clothing. Carly Mitchell returns to the small town of Yeardon in Yorkshire almost a year after running away on her wedding day. Now she wants to try to make amends with Steve, his family, and the townspeople who had prepared a huge party to celebrate her New Year’s Eve wedding. She intends to stay only for a few days at the Resolution Hotel, owned by Steve’s parents. However, her plans change when Steve’s father is taken ill, and she feels obliged to step in and help with running the hotel. This also means having to deal with Steve’s antagonism since he has never forgiven her for humiliating him. A further complication comes in the form of Ben Thornton, the local doctor, to whom Carly feels an immediate attraction. They enjoy getting to know each other and falling in love, until a famous model from Ben’s past arrives in the town, and stays at the hotel. Steve attempts to get his revenge on Carly by driving a wedge between her and Ben, and by threatening to reveal what he knows about Ben’s troubled past unless Carly leaves town. The resolution lies in Carly’s hands as she struggles between wanting to flee from the town again and wanting to stay with the man she has grown to love. Resolutions is Carol’s debut novel and is set in a location close to where she lives. Writing has been her love since childhood. She started by making small comics for her dolls, progressed to training as a journalist for a short while. Once the family had grown up Carol settled down to writing and published short stories, poems and holiday articles. 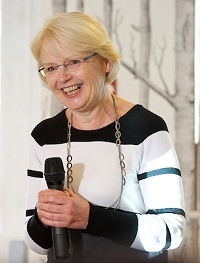 In recent years she has become a judge in the short story section for the HysteriaUK competition and also for the RNA’s romance novel of the year. Carol lives in Yorkshire, surrounded by some beautiful countryside, which is ideal for her other passion of walking, often with a dog called Sam. This lovely area is the location for her first novel, Resolutions. Many thanks for visiting today Carol. Good luck with your new book.